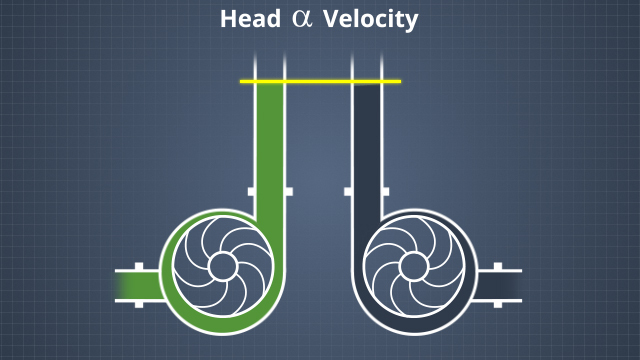 As the impeller rotates, centrifugal force pushes liquid outward from the center, or eye, of the impeller, which creates a low pressure zone that allows more liquid to flow into the pump. There are different types of centrifugal pumps. They come in a variety of sizes and have different pumping capabilities. For a given pump diameter and impeller speed, a centrifugal pump will produce the same head, regardless of the liquid being pumped. 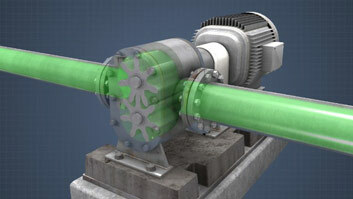 Pumps are used to move liquids from one place to another by increasing the mechanical energy of the liquid. The energy can be used to raise the liquid to a higher elevation or to increase its velocity or pressure. In a centrifugal pump this is accomplished by rotating an impeller which creates centrifugal force that transfers energy to the liquid. This module focuses on pumping principles and operation guidelines for typical centrifugal pumps. 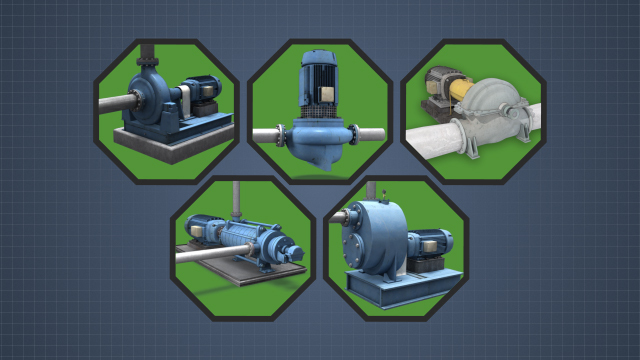 What are common centrifugal pump types? Common centrifugal pumps include: end suction, inline, double suction, multistage, and self-priming pumps. The type and size of pump depends on the application. 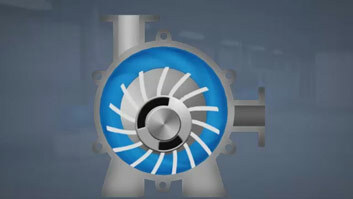 End suction pumps are the most common. 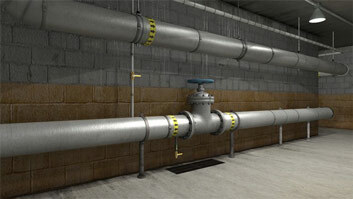 Inline pumps require less space and piping is easier, but they are size limited. 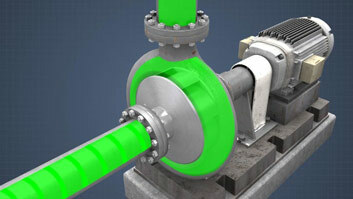 Double suction pumps are usually used for high capacity applications. Multistage pumps are used to generate high pressure. 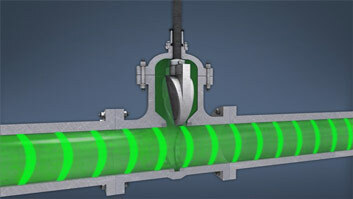 Self-priming pumps are used for high suction-lift situations. Head is the height above the pump that a pump can raise water. Cavitation is the formation and collapse of vapor bubbles in the liquid being pumped. The bubbles then implode, which can cause significant damage to internal pump components. There are many causes, such as low suction head, small diameter suction piping, high liquid temperature, or an inappropriately-sized pump. What is best way to control flow from a centrifugal pump? A variable speed drive is the most efficient way to control pump flow. A centrifugal pump consists of a rotating impeller mounted on a shaft inside a stationary casing. 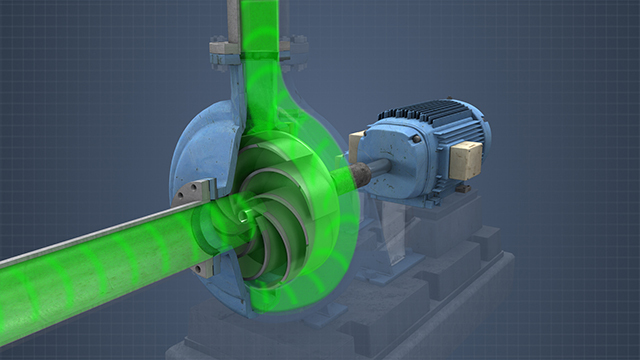 An electric motor, or some other driver, is used to rotate the impeller at a high speed. As the impeller rotates, centrifugal force pushes liquid outward from the center, or eye, of the impeller. This increases the liquid velocity and creates a low pressure zone at the eye of the impeller, which allows more liquid to flow into the pump through the suction inlet. Vanes on the impeller help direct the liquid to the outer edge of the impeller and into a gradually expanding channel, called the volute which collects the liquid and directs it to the discharge port.